Formally a part of the Southern Cross Range of irrigators, our RI Range consists of 3 smaller sized irrigators the RI 10, RI 20 and RI 30. They are the ideal solution for small to medium irrigation needs. From golf courses to playing fields, turf farms to mining sites. 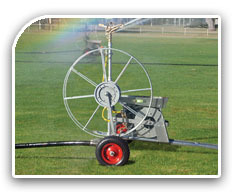 These Australian designed and manufactured irrigators boast hot dipped galvanizing to protect the machines from the harsh elements as well as increase their durability. They are simple to operate and have the power to handle all conditions. Spare parts and backup service are readily available.